Facebook, Instagram and Twitter, has become the inseparable part of ours; we use it for entertainment and social reasons. Similarly, LinkedIn is a part of professionals. It is not just a networking tool to connect with professionals, but a great tool to publish your accomplishments, share knowledge and find jobs. Many subject experts use it as a place to share their views on different subjects through articles and posts. Many use it as a marketing tool. Having a LinkedIn Account is a must for all. Though the question arises, is it enough to just own a LinkedIn account? In addition, the answer is NO; we are present there to be connected and majorly to move ahead in our career by making us visible to notable people. After the name and photo, the most important and notable thing one observes is the headline. Thus, Having a Good LinkedIn headline is very important, but sadly, many miss it. People need to realize that they are wasting too many networking and job opportunities due to bad headline. LinkedIn does insert a default headline by looking at your current position and current organization. Still it is not enough. Let us look why and then the tips and hacks to make you stand out and be found easily. 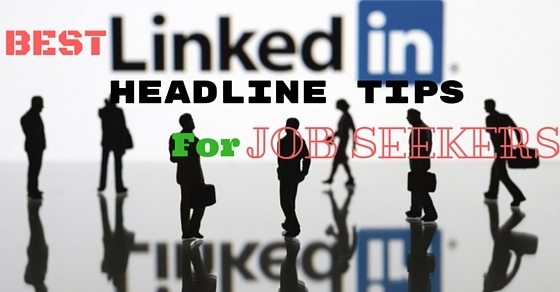 Why You Should Not Use the Default Headline of LinkedIn? The reason one should avoid using the default headline is that it states the obvious. LinkedIn automatically generates headline by grabbing your current employer and your position and probably this makes people lazy and they do not feel the need to change it. A person, who will look at your profile, will get to know about it when he looks at your summary, so a generic headline is not adding anything fruitful. LinkedIn gives you 120 spaces to fill in with something interesting and not utilizing to brand yourself is obviously a mistake that people make. Most often recruiters and employers are the ones who look for suitable candidates relentlessly. Alternatively, there are people who want to increase the network in similar industry and expertise. In both the cases, you clearly need to mention who you are. You have to choose the best words to describe yourself, and be found in the search. The key is to be found easily is to use suitable keywords in your headline. Keywords can be your current job or the job you wish to have. These keywords will increase the probability of being found easily. Let us look at three examples and the impact it has. Case 3: it has an appeal, it gives the clear information of his specialties and skills, and it gives a positive image. So if you are a recruiter whom among the three cases would you rather choose? Which case is more likely to top the search list? No wonder it is going to be the case 3. It is proven that profile with such headline will get more visits and hence more job offers. Thus, it is necessary to display all your skills in suitable keywords and fit in as much interesting data that one can in the 120 spaces provided by LinkedIn. So If your headline is plain and boring as the case 1 then its high time you change it, in Case 2 only one keyword is focused whereas the third one is a star performer. Headlines are there to display your accomplishments and skills, but bragging about you is totally a No- no. So words like Social media transformer, the Magical marketer should totally be avoided. It is not at all impressive nor does it add any values to the recruiters. Many organizations give designations, which does not give much clarity of the role, will make you people in a confused state. A designation like Assistant principal consultant does not state exactly the role you have. The role is of recruiter and HR consultation, but designation does not give this clarity. Hence putting up fancy designation with no clarity should be avoided. No one knows the names of all companies unless it is a very well reputed MNC like Google Microsoft or Apple. Which speaks a thousand words on its own. However, if you do not belong to such organizations, you have to put in something interesting in your headline for attracting people. Like a renowned college you went to, or your greatest achievement or the awards your company won. Bring some value and credibility to your profile. Very often job seekers put looking for a change, ‘seeking new opportunities’ in their headline, but let me tell you it does no good to the job search and rather makes you sound desperate. An active job seeker will not just sit and wait for people to find him, but will take suitable steps to be found. By writing such headlines, you are making yourself lost in the crowd. Displaying your skills and connecting with the right people is the best way to get a job. Now that we saw what things to avoid, let us focus on what is the way to write the most effective headline. Step 1: Analyze what you are – are you a recruiter? A writer, a doctor? What is your job profile? Step 2: analyze whom do you help? Step 3: How you benefit them- are you a digital marketer who can help people achieve the highest visibility. Alternatively, are you a recruiter who help to get the right talent placed at the right place? Find the appropriate words to state your work precisely. Step 4: Prove your credibility – you can mention the notable accomplishment in short for people to believe you and to bring additional values to your profile. The principle of – if you have it then flaunt it, works quite well in these situations, provided it is stated subtly. So the ultimate formula is to depict- ‘what, who, how, proof’ formula for your LinkedIn headline, it is a full proof way to have the most attention-grabbing a headline. With such headlines, people get the gist of your experience in few words, which do the trick of better connections and good opportunities. The way the SEO experts optimize their websites by putting important keywords at the beginning of the content, similarly one needs to put the most important word as the first word in the LinkedIn headline. This makes your profile be found at the top of the search result and increases the probability to be easily found and to be clicked. You can find people with similar expertise as yours and look at their headline, you can use their headline as a guide and frame the same for yourself, don’t worry, no one will blame you for cheating, provided it’s not a word to word same. Alex stated all his skills, but it sounds like just a list of programming languages, whereas Rob’s headline looks catching as impressive and states that entire one requires knowing. Thus, it is good to be specific but should avoid rambling all you know. A mistake in the headline will make an impression that you are a careless person, hence proofread each and everything you post especially headline. It is like a red flag to a recruiter and hence you would be skipped by most of them. It is OK to add acronyms like SEO and SMM, which is known widely, but adding acronyms for your designation and college name will make the people puzzled, which are certainly a thing, which you must avoid. No one is going to research on what that acronym mean, it is more convenient for them to just skip to the other profile which easily matches their requirement. If you are not having experience and just putting your college degree in the headline, then you are missing many opportunities. The best thing to do is put up a job profile you wish to have. In spite of several tips and tricks, one may fail to come up with a creative and powerful headline, so it is best to take help. You can contact few recruiters in your network and ask them for help. Ask them which keywords they use often, which keywords grab their attention and the best way to tweak your current headline. Very often, the recruiters will help you out. One may also join a recruiters group and post the query, you may amaze to get the witty and impressive responses. One can be witty and creative while stating their LinkedIn headline, if one can pull off being funny and witty and yet professional then nothing can be attention grabbing than that. Though one must take care not to go overboard as it may be frowned upon by organizations that are not having a very open culture or you may simply sound unprofessional to few recruiters, a good balance is suggested. Apart from jazzing up your LinkedIn headline, there are few more steps one needs to do because a recruiter will reach your profile but if he does not find anything mentioned in your profile you are just wasting the recruiter’s time and your opportunity is of course lost. Comment on famous articles on the pulse, with some insightful comments and ideas. With the above-mentioned tips and tricks, one is bound to get good job offers. Feel free to share any queries and ideas you have. Surely, the above tips and tricks are not all one can do. Until then, Happy Job-hunting!